The Texas Capitol is a beautiful building. Built in 1888, it was constructed of limestone (foundation), masonry, and cast iron (structural support). The exterior gets its wonderful color from granite quarried only fifty miles from the site. An interesting bit of trivia is that the construction was financed with land instead of money - three million acres that became the XIT Ranch (which operated famously from the late 1880's to the early 1910's). I took this photo from the side, capturing only the western wing and front entrance of the structure. I didn't quite realize how big the building was until I was inside. 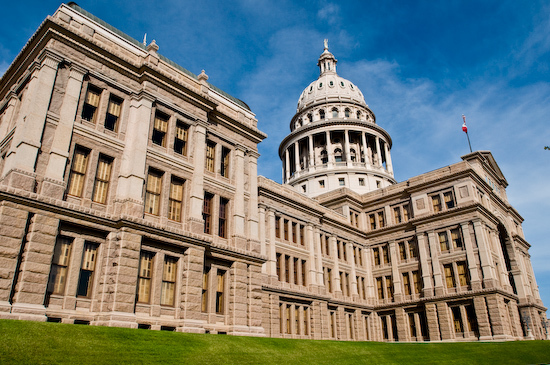 Turns out the Texas Capitol is the largest of the state capitols (in square footage). Denali (or Mount McKinley as the official maps call it) is the tallest mountain in the world from base to tip. Mount Everest's peak is higher above sea level, but no mountain comes close to the rise and vertical size that Denali has. On our more recent trip to Alaska, we stayed at the Denali Backcountry Lodge in Kantishna within the heart of Denali National Park. On the evening of our arrival, there was clear weather around Denali - a rare event. Usually the mountain is shrouded in clouds and impossible to see. We went with a small party from the group that was staying in Kantishna that evening and was driven to the northern shore of Wonder Lake (in the foreground) for a clear view of Denali. I set up the tripod and took a few photos when the guide wanted to head back and asked us to return to the vehicle. I was a little upset - on my previous trips to Alaska I had never had the opportunity to see Denali and here it was! It was a bit past 10:00pm so I could understand why the guide wanted to return to camp, but we were only half an hour or an hour from the magic Golden Hour before sunset (which in Alaska in the summer lasts about 2 to 3 hours). Unfortunately, I didn't make a fuss about it and I missed it. The next day the mountain was completely obscured and it was the last we saw of Denali. You can see that the light has just started to change and produce that yellow glow that would have made this picture great. I still regret not making more of a point to stay. Living next to a major expressway means that every once in a while we'll hear a car accident or near miss (the screeching of tires as drivers swerve and brake). A couple years ago, there was a particularly loud crash and when we looked out the window there was an over turned vehicle. 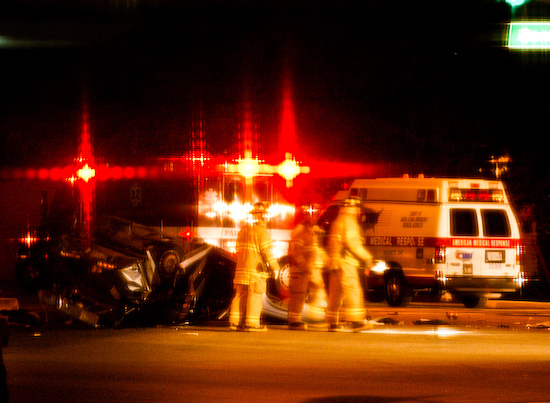 The paramedics arrived within a minute or two (I live about 300-400 yards from a Fire Station) and, as far as we could tell, the driver walked away from his vehicle. Since I almost always have at least one tripod setup with a camera in my home (usually for photographing food), I was able to take a couple pictures of the accident. The odd looking blocky crosses formed by the emergency lights are caused by photographing through a window screen. I find photographing people to be a fairly difficult. It might be because I've spent so much time taking pictures of landscapes and food (both mostly non-moving scenes) that I just haven't had much practice taking pictures of moving people. Also, I've noticed that interesting people tend to be in poor lighting conditions and also have a tendency to have awkward facial expressions when their bodies are in a graceful pose or vice versa. I took this picture of a dancer at the Winter 2007 party thrown by the company that Tina works for. 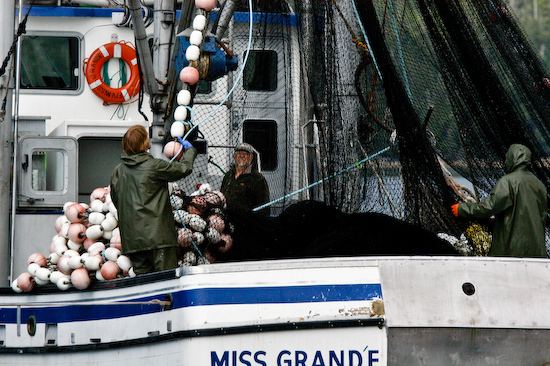 Sometimes what the camera records is drastically different than what we see with our eyes. 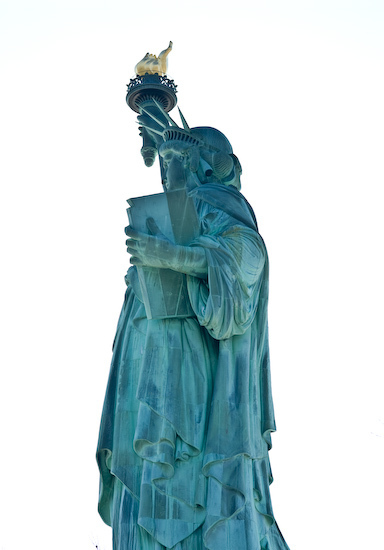 In this case, I photographed the Statue of Liberty with the sun in the background and overexposed the image by choosing to meter the statue at neutral/middle brightness. 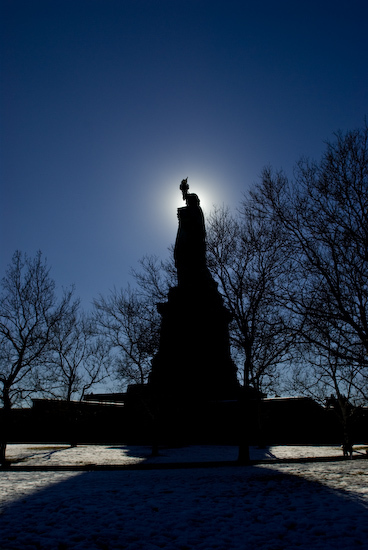 The second photo shows the Statue of Liberty underexposed by about 2 stops to produce a strong silhouette. 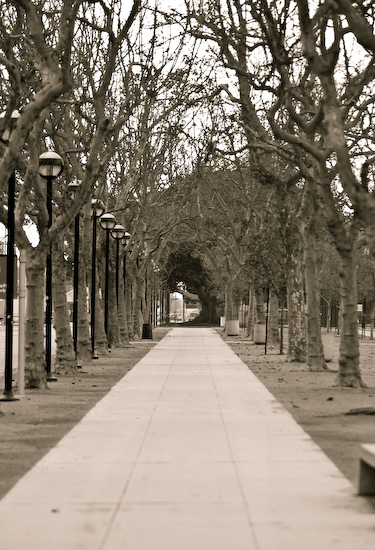 I didn't really think about it when I took this picture near Exposition Park in Los Angeles, but whenever I see it, I feel melancholy. I decided to sepia tone the photo because it felt right. 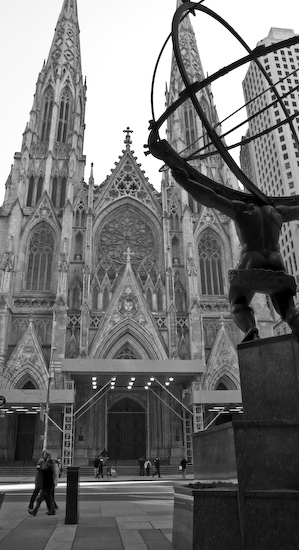 I really liked the juxtaposition of the statue of Atlas holding the world in Rockefeller Plaza directly opposite of the St. Patrick's Cathedral. The California Coast is an undeniably romantic stretch of landscape. Walking along the cliffs or strolling along the beach - it's relaxing and the invigorating at the same time. It's no surprise that on any given weekend, you'll probably come across a wedding party having their pictures taken. We usually leave them alone or walk around them so as to not intrude, but sometimes I just can't resist taking pictures of random people living their own lives. Queenstown (on the South Island of New Zealand) is one of the most picturesque places I've visited. It's on the edge of Lake Wakatipu (a huge lake) and has a great view of the Remarkables and the Eyre Mountains. 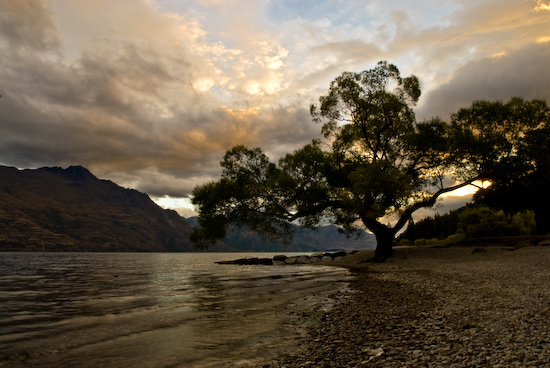 Here, a lone tree on the shore of Lake Wakatipu is silhouetted against the sunset and the Eyre Mountains.